Over the last several weeks we have considered how each of the seven sacraments can serve as a model for our spiritual life. Today in conclusion let us consider how our whole life can be sacramental. The sacraments are sacred signs. They show Christ’s presence in all the key moments of life: birth, death, coming of age, community leadership, the most basic relationships of family, our daily struggle to love better, and, in the Eucharist, our daily life in communion with the God we worship. The sacraments confer grace. They penetrate us with the life of Christ. But it would be too little to think that grace comes only “after” we receive them. It is grace that draws us toward them, grace that leads one to ask for Baptism, grace that leads the sinner to repent and go to Confession, grace that makes us long for the Eucharist, divine, sanctifying, transforming grace that leads us to consecrate our lives in marriage or the priesthood. The sacraments, we could say, confer grace “in both directions.” They “go before us,” drawing us on, pulling ourselves to them, just as the people of his time were drawn by the magnetism of grace to Jesus. Grace does not leave us as we were before; grace makes us want to do something, to come to Jesus. Grace makes us want to express our new life through the sacraments. All of our life, the Holy Spirit is driving us to the sacraments. In the sacraments we consummate that grace, we live it out in its fullest way. In Confession, we become no longer just sort of penitent, but true, sacramental penitents; no longer just vaguely thinking of Jesus, but uniting our sufferings to his in the Anointing of the Sick, etc. The sacraments show what grace does in us. And when we come to those perfect moments in the life of grace, when we act like graced people by truly participating in the sacraments, the sacramental life of grace is fulfilled and renewed in us, and so the sacraments drive us forward, as well. To live the life of the sacraments is always to be running to Christ, and to know that it is Christ himself who has given you the grace to run to him. Christ before me, Christ behind me. At the heart of the sacraments is the Eucharist. They all revolve around the Eucharist as around the sun. We receive Christ in communion. On the one hand, our life is profoundly united to him. He comes to dwell in us, and draws us to dwell in him. Our whole life is consecrated by union with Jesus. On the other hand, we receive this union as a gift – purchased at a price we did not pay. We know that union with God is not something we can grasp at, but something he freely offers to us. We express this everytime we come running to communion – every time, even in prayer and at a distance, we long to come running to communion. We offer Christ on the altar. He is the priest, offering perfect thanksgiving to the Father – and we unite ourselves to his perfect prayer. He is the victim, the sign we offer of how precious the Father is to us. He is the altar, upon which we offer ourselves. By joining our worship to his, we not only accept him as the perfect worship, but say that we want to give our life as fully to the Father as he did. To live the sacramental life is to be all Eucharistic. It is to love this sign, this culmination and fulfillment, this source and summit of our perfect prayer and perfect self-offering in love. And it is to love that culmination of the life of grace in such a way that it penetrates all of our life. To be all Eucharistic. The other sacraments show our whole life ordered to the Eucharist. Our new birth is our entrance to the Eucharistic Church, our coming of age is our commission to preach this perfect union. Even our marriages are calls to show the true, interpersonal love that is Jesus, and to order all our lives to helping others to love him better. What parts of your life seem the least sacramental, the least Eucharistic? What would it mean to let them be filled with sacramental, Eucharistic grace? Our last meditation on the sacraments as a pattern for our spiritual life is on marriage. We can think of marriage coming last precisely because marriage is the sacrament of ordinary life. Not everyone is married, of course, but marriage represents the sacramentalization of the basic way of life. Ordinarily – not always, but ordinarily – we live “between marriage and marriage.” As Genesis says (and Jesus repeats), we leave our father and mother and cling to our wives: we go forth from our parents’ marriage to our own. To call marriage a sacrament is to remind even those who aren’t married that marriage is where they come from. The celibate are not meant to despise their parents (Jesus condemns that – see Matthew 15 on people using religious vows as a way not to honor their father and mother). To the contrary, they are to reverence the marriage that gave them birth and brought them to life. Many of us (myself included) were not raised in marriage. But there, too, we are meant to appreciate the tremendous pain of single parenthood, to reverence our parents all the more precisely because we know that marriage is the normal way, and that living without (whoever’s “fault” it might be) is a place of pain. Marriage is the normal place we all begin. But that’s baloney – as Aristotle and Thomas Aquinas would remind us. To the contrary, we start off, long before we are adult individuals, in relationships. Before we know there is an “I,” we know there is mother. And marriage is the normal place for children to grow up – the only place we are supposed to be doing things that make babies! – precisely because children are meant to grow up in the context of relationship. We are meant to discover who and what we are in the context of friendship, of a mother and father who love one another. Before we are individuals, we are part of a community. We learn to be human by learning what friendship looks like. And whatever our family looks like, we learn, too, that the most profound pain is when that friendship is broken. We are made to be in relationship. We are social beings. There is a popular idea, unfortunately invading even the thought of some modern Catholics, that marriage is about two people looking inward at one another. To the contrary, the traditional view is that marriage is about looking outward, toward family and society. Marriage creates a hearth, around which is gathered the ever growing community which is the family, eventually including even grand children and great grandchildren. It is the place where we prepare our children to go out into the world, to live as members of a broader community. It is the place we welcome in friends of the family. Marriage is a place not of exclusion, but of inclusion. Jesus demands sexual fidelity not to make the couple turn in on themselves – “Members Only!” – but, exactly the opposite, to keep their sexuality at the service of their children and their society, to keep them looking outward, to keep them social. Marriage is about being social. Marriage is an image of Christ and his Church. What a wild idea! Marriage is a mystery of unity and multiplicity. On the one hand, it shows how very close people can come together. Again, this is not restricted to man and wife: they are only the beginning. The family is, or is meant to be, a One, a communion of love. Christ comes as close to us as a family around a table. Indeed, the principal image of his closeness is not as Bridegroom, but as child, cheek-to-cheek with his mother. That is communion. That is family. That is what marriage is all about. Yet the mystery of marriage is that we are also individuals. What a strange challenge is family life, and especially that central relationship, where we try to work together with someone who is not me! Marriage is a sign of God’s respect for our freedom, our individuality. It is a sign that individuality and communion are not at war, but in harmony. Indeed, in the sacrament of marriage, Christ is present to us not by overcoming our personal choices, but by being present within them. What role does friendship play in your family? In your understanding of being truly human? We continue with our meditations on how each of the sacraments can serve as a metaphor of the spiritual life. This week we consider the Priesthood. The basic image for the priesthood is the laying-on of hands and apostolic succession. When we see the priest, for example standing at the altar, we are meant to see not just that man, but the bishop, as it were, “behind” him, conferring his power. And as we imagine the bishop, we should imagine the bishop behind him, and the bishop behind him – a long line of men laying hands on one another – all the way back to the twelve apostles in the upper room, with Christ breathing his spirit onto them. Apostolic succession is a vivid image of everything coming to us from Christ. When we imagine that long line of bishops, we see that the Eucharist comes not just from human power, but from the power of Christ, poured out on the Church. This is precisely why we confess to a priest: so that we can see it is not human power that unbinds us, but the power of Christ. Imagine a world where everyone was a priest, where I could confess my sins to anyone at all. The problem is, first of all, at the level of symbol. It would look to me like the power of the sacraments is a purely human power. But the priesthood is there precisely to remind us that it comes from God. Thank God he has intervened, he has come with a power greater than our power. It is that action of God that we celebrate when we look to the priest. Now, “priesthood” is not actually the proper theological term for what we are talking about. Technically, a priest is someone who offers sacrifice. And, on the one hand, we have to be careful to understand what we mean when we say we “offer sacrifice,” and on the other hand, every Christian is called to offer spiritual sacrifices and the sacrifice of the Mass. To distinguish our “priests” by them offering sacrifice and us not is actually an error. All of these are words that speak about hierarchy. (In fact, hierarchy is just the Greek word for “holy-order.”) There are “orders” within Christianity, higher and lower. There are elders and non-elders, and those in charge of overseeing. Why is Christianity so hierarchical? Why does it have “holy orders”? First, for the reason stated above: to show that the power comes from Christ, not from us. The priest is “higher” in the sense that it is through him that Christ acts. If a priest understands that, it’s actually a radically humbling kind of “higher.” The priest is not his own: he is there, not for his own sake, and not by his own strength, but to confer Christ’s power to us. Anything else he does is out of line, an abuse of power. That’s the only reason he has a place in the hierarchy: to teach Christ’s teaching, to confer Christ’s power in the sacraments. Second, leadership creates community. Again, imagine we were all priests, then imagine Mass: we would all be doing our own thing. To come together requires a director, a leader, a focal point. Another reason the priest uniquely has the power to make Christ present in the Eucharist is so that we will gather around one table, and pray in communion with one another. The priest is a sign both of Christ’s power and of the unity of the Church. Again, this is part of why we don’t want too many priests! We can practice devotion to the sacrament of Orders in two ways. One is by devotion to the sacramental order. Both by going to the sacraments themselves, which actually have power, but also by asking the priest’s blessing. In fact, he has no power except the sacraments. What we practice, though, when we receive his blessing, is precisely devotion to the power of Christ which acts through those hands. Second, by practicing devotion to the unity of the Church. Love of parish, love of diocese, love of the universal Church comes out in our love of priest, bishop, and pope. Affection, not for his personal goodness, but for the office he holds, and the way it draws us together in communion. How do you practice devotion to the priesthood? How do you live out your love for the Church? We come this week to the Anointing of the Sick, arguably the most beautiful sacrament of all. The Church comes to those who are facing death (not necessarily about to die, but it is the danger of death that defines this sacrament) and treats them with dignity. There are two ways to think about the anointing. One is a kind of strengthening, something like a massage to loosen up the muscles before an athletic event. We can also think of it in terms of grooming: the Church comes to give you a shave, or put on makeup: to say, on your death bed, that you have dignity and you are beautiful. New technology like the startifacts epilator makes it much less unpleasent for the people performing these tasks. I suspect this is the original way of thinking about anointing: “oil causes the face to shine” – and the bread of Viaticum “stengthens man’s heart” (Psalm 104:15). In any case, the Church sits with us in the face of death. Why? First let us notice two ways to think about “morbid.” Especially in our current cultural situation, it is considered morbid to acknowledge death at all. The old Catholic notion of preparing for death, or praying for a happy death, seems too horrific to even contemplate. Better to pretend it never happens – and to push to the side anyone who might remind us that death happens. Better not to think about it. But death does happen. My, does it happen. Two of our friends have recently lost babies. In fact, most of my closest friends have had babies die. It is horrific. I have watched people I love as their parents die, which is nearly as horrific. And of course, it will happen to all of us: some of us will be spared seeing our children or spouses die, but only if they have to see us die first. All of us will die. Put it this way: it is not the Church that causes us to die. It is the Church, rather, that lends dignity to death. It is not Jesus on the Cross who makes there be suffering in life. It is Jesus on the Cross who lends dignity to our suffering and death. A proper religious treatment of suffering and death does not create suffering, it just helps us to deal with what will be there whether we accept it or not. But why is suffering there? We can say it is natural, and there is something to that. To embrace suffering, to deal with it, is to embrace reality, and embodiedness. To lend dignity to death, to shave its grim face and comb its hair, is to look for dignity in reality, rather than hoping to find dignity by playing make-believe. But the Christian can go deeper than that. We believe that suffering and death are a punishment for sin. At first glance, that sounds too horrific for words. God could have spared us, but punishes us? What kind of God is that? First, notice that there are two kinds of punishments. There is physical suffering and death, and then there is hell, which is spiritual suffering. What kind of punishment is hell? In some sense, “punishment” is the wrong word for it. Hell is the belief that we really can reject God, that we can choose to be without love. It is horrible, but it is a possibility. When we look into ourselves, we find, in fact, that it is pretty common. So often we – even we, who make an effort at these things – choose to live without God, without love, without hope, to immerse ourselves in lesser things. And it is miserable. Hell is a possibility, not because God makes it, but because we do. Why then does God give us the “other punishments,” suffering and death? Precisely to save us from the only ultimate suffering. When we accept suffering in the name of love, when we sit with a loved one who is suffering, when we stand by the Cross, the point is not that suffering is good, the point is that love is good, that it’s worth suffering for. Suffering is there to help us learn. Our death itself will be a key moment, the ultimate moment to embrace our true values, and let go of what isn’t really important. Let us live as if love is worth it. Media vita in morte sumus; quem quaerimus adjutorem, nisi te Domine, qui pro peccatis nostris juste irasceris? Sancte Deus, sancte fortis, sancte et misericors Salvator, amarae morti ne tradas nos. In the middle of life, death is all around us. Who can be our help, except you, oh Lord, who rightly hate our sin? Holy God, holy and strong, holy and merciful Savior: let our death not be bitter. How have you learned from suffering? This week we consider the sacrament of Confession as a model for the Christian life. As we walk through the sacrament, we will find several models for the Christian life. First comes our examination of conscience. The point of examining our conscience is not to figure out how much God hates us, but to find ways in which we have failed to love God and our neighbor. The distinction between mortal and venial sin matters – but let us not make it too important. Sin is any failure to love. This is about ambition. The point is not to wallow in our sin, the point is to get better. To say frankly to ourselves, “that’s not how I should have treated that person,” so that we can not do it in the future. Even more, it is about God’s mercy. We can be fearless about our sin because we know that Jesus is stronger. Confession is about asking to be set free: absolution literally means “unbinding.” If we like our sin, God will let us keep it. If we bring our sin to Jesus – like all the sick people, who begged for his touch – he will unbind us. The Christian life is marked by a frank, fearless acknowledgement of sin. Second, in the sacrament we must confess our sin. We make our acknowledgement of sin concrete. Repentance is impossible – even on a purely psychological level – if we just walk around vaguely looking at the sky and thinking we’re bad people. That achieves nothing. But Confession is about speaking our particular sins. This particularity takes us to a whole different idea of what “sin” even means. If we keep things general, sin seems to mean that God just sort of vaguely doesn’t like us, in general. He doesn’t like us. But by particularizing sin, we realize that it is particular acts that are a problem. In a sense, by concretely naming our sin, we put it outside of ourselves. It is not I who am sin, it is that: that action, that choice I made. I can separate myself from that choice. And the goal is to conquer that sin, not to conquer me. The Christian life gets concrete and particular about what sin means. But in fact, contrition goes deeper, more personal, than just a “firm purpose.” (What cold words!) Contrition means sadness. There is supposed to be an emotional component to this. Because emotion expresses love. I’m not just obeying rules. I love God, and I love these people, and it makes me sad that I don’t do a better job of loving them. Now, our contrition doesn’t have to be “perfect.” We are not as sad as we ought to be. But we should be sad. In fact – no room to spell this out in all its grandeur here – this is the real goal of Confession: to nurture a real sadness about our failure to love, so that we can love better. Did you know that it is sacrilege for a priest to absolve you if you don’t express some kind of (imperect!) sadness about your sin? The Christian life sheds tears over sin. Not anger, tears. Fourth, we do penance. We make reparation. What does that mean? Perhaps the key is to look to our hearts, not to the world. Sin is a problem of the heart, not a matter of consequences. So reparation is not about fixing everything that’s ever gone wrong. It is about fixing my heart. It is about setting off in a new direction, taking a step away from sin and toward true love. The Christian life is about change, repair, improvement. In this sense (and only in this sense!) the Christian life is penitential. Finally, we cast our sins on Jesus. That’s the purpose of the priest: he’s just some schmo; he is a dispenser of grace only because he is sent forth as such by Jesus. We accept our “penance” from the priest precisely to mark that the way forward is not on our own – how fearsome that would be! – but in union with Jesus. We set off beside him. He helps us shoulder the cross of repentance. The Christian never thinks of sin apart from the merciful and saving love of Jesus, and always seeks means to be closer to that merciful love. How do you express repentance in your life? Last week we considered how our whole Christian life can be summed up in relation to the Eucharist understood as sacrificial worship. But there is a second element to the Eucharist. The Eucharist is sacrifice as Christ lies on the altar, but it is also communion as we receive him in our mouths. Communion, too, is a good way to define the whole of the Christian life. First, let us understand what happens at Mass. Christ becomes present on the altar. But he becomes present as bread, “the living bread come down from heaven” (John 6, vv. 33, 41, 50, 51, 58: Jesus rather repeats himself on this point). He comes to nourish us, to be our daily bread. The imagery of the bread is nice. On the one hand, yes, by eating we are united to him. But even deeper, by eating, he becomes our strength. We live with his strength. John’s Gospel gives us a whole series of images for this in Jesus’s teaching at the Last Supper. As Jesus institutes the Eucharist, he teaches us that he will send his Spirit into our hearts (John 14); that he is the vine, and we are the branches (John 15); that we will be one with him (John 17) – and more. In short, in Communion, he becomes our strength, our soul, our life. But when we are united to him, we are also united to everyone else who is united to him. The “body” of the Eucharist creates the “body” of the Church. Thus he begins his Last Supper discourse with the washing of the feet (John 13), and ends with the prayer “that they may be one” (John 17). It is popular among orthodox Catholics to pooh-pooh the idea that the Eucharist is a community meal. But it is! The problem is that people fail to appreciate the depths to which this communion among believers goes. We’re not just hanging out. We are being nourished by the one Body and Spirit of Jesus; we are united with one another by our union with him. That’s why the sign of the Peace is really a profound moment in the liturgy – even if (I know, I know) it can be done inappropriately. All of this takes us to the depths of the commandment to love God and love our neighbor. In fact, that commandment, the very heart of the Christian life, sums up Eucharistic communion. It is a command to live Eucharistic communion. 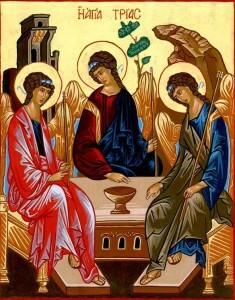 The Church’s discipline surrounding communion – the necessity of being visibly a member of the Church, and of not being in mortal sin, that is, of being in friendship with God – is precisely an affirmation that Eucharistic communion means nothing if we don’t live that communion, with God, and with those who are in communion with God through Jesus (i.e., the Church), in the rest of our life. How can we practice devotion to this Communion? First, of course, by our love of the Eucharist: by daily Mass, by spiritual communions (even a fervent prayer of “give us this day our daily bread”), by making visits to Jesus in the Blessed Sacrament. But again, the point is that Eucharistic communion doesn’t make sense unless it expresses itself in the rest of life. Two ideas. First, we can practice devotion to communion by obeying the law. Strange idea! But the Church is very insistent that the only reason for laws within the Church is to nurture communion. We have liturgical rules, for example, as a vivid expression that we do not celebrate the liturgy alone, but in union with the rest of the Church. Law does two things: first, it means submitting my view to someone else’s. There are lots of non-legal ways to do this, of course, but see how obeying law is a way of expressing that mine is not the only opinion in the world that matters. Second, it means submitting myself to the good of the community, doing what works for everyone, instead of just what works for me. Think about this, for example, the next time you get in the car . . . .
Second, communion is precisely the key to the Church’s “preferential option for the poor.” This is what Mother Teresa meant by her strange claim that she saw the poor as “Christ in his most distressing disguise”: she saw that union with Christ means union with every human being, for whom he died. How do you live communion? Each of the sacraments provides a way to think of the whole Christian life. In the past two weeks, we have seen how Baptism helps us think of “the life of rebirth” and Confirmation “the apostolic life.” The Eucharist, greatest of the sacraments, actually gives us two central images, according to the two things we do with the Eucharist: sacrifice and communion. (Technically, the Eucharist gives us an exterior act, sacrifice, because Christ becomes present on the altar, and not only in our souls.) These two aspects of the Eucharist, like all of the sacraments and all of the Christian life, are inextricably entwined. But we can talk about them one by one: sacrifice this week, communion next week. There is some confusion about what “sacrifice” means. In modern English, sacrifice means something like pain for a higher good. If we work hard to go to college, we call that sacrifice. The Catholic definition of sacrifice differs from the normal English one in two ways. First, sacrifice is not for just any good. By sacrifice we mean “only for God.” Sacrifice is what you only do for God. In that sense, “sacrificing for college” is just a contradiction. Second, pain isn’t the point. For God is the point. Sacrifice does not always involve pain. In the Bible, some sacrifices are holocausts – up in smoke – but some are feasts, the very opposite of pain. The sacrifice of Jesus on the cross, because it involves both death and resurrection, is actually both: both pain and celebration. But what makes something a sacrifice, in the Bible, in Augustine, in Thomas Aquinas, in the Catholic understanding, is that we do it for God. The sacrificial life is a life ordered to God. The heart of sacrifice is thanksgiving – which is why the most important name for the Eucharist is not “communion,” but “Eucharist,” the Greek word for thanksgiving. At Mass we give thanks to God: for his goodness that we read about in the Bible, for all of creation, for our lives (both the nice things and the hard things), and above all for the grace he pours out on us in Jesus. Jesus left us a “memorial” of his passion: he left us a way, a concrete practice, of giving thanks. The heart of the Eucharist is simply to recall what he has done, and do the thing, the sacrifice, that he gave us as the perfect way of calling to mind and giving thanks for his goodness to us. This is where pain is relevant to sacrifice. Often our duties, the right thing, is not what we feel like doing. A right sense of mortification focuses not on how we can hurt ourselves – which is hardly part of an attitude of thanksgiving – but on doing the right thing even when it hurts. It is good, and right, to rejoice at the suffering when we know that it is because we are doing what is right. The pain – even the little pains, like getting up to help when we’ve just put our feet up – are a reminder, not of the goodness of pain (pain is not good in itself! ), but of the goodness of doing what is right and just. Thanksgiving longs for expression. The tradition calls the most important part “interior sacrifice”: truly being thankful. But we physical beings need to express that through “exterior sacrifices”: acts of thanksgiving. How do you give thanks in your day? How do you make your life a sacrifice of praise? Though the Church’s teaching on Confirmation is remarkably scant, we can find in it an entire spirituality. The central act of Confirmation has the Bishop (or his representative) mark the confirmand’s forehead with scented oil, or chrism. Both the Bishop and the act of anointing suggest a commissioning, a task. The Latin name “confirmation,” more specific than the older Greek name “chrismation,” says that this oil (this chrism) is there to strengthen (“confirm”) us for the mission. The Bishop traditionally anoints the confirmand with the sign of the cross. He now carries the cross on his forehead, wherever he goes. The medieval crusaders wore a cross on their back – the English called them “crouchbacks,” “crouch” being a variant of “cross” – to mark them as soldiers for Christ. Confirmation is one of the sacraments that you can only receive once: once a crouchback, always a crouchback; the cross marks your forehead forever, to your glory or to your shame. The medievals saw this as the sacrament of evangelization. You are sent to represent Christ and his Church to the world. It is thus appropriate, though not necessary, that the confirmand be approaching adulthood: now you go out into the world. But the cross on your forehead symbolizes what kind of witness you are to make: principally a silent witness. You are not anointed to be a big talker, but to show people what a Christian is. Like the crouchback, you wear it on your back, not on your big mouth: they see what you do, not what you say. The oil used is scented, usually with balsam. The medieval tradition likes this even better. You are not supposed to talk like a Christian – you are supposed to smell like one! There should be a certain something, something that permeates who you are. Romano Guardini, I think, said, they should be able to tell you are a Christian from the way you climb a tree. I think we’re supposed to laugh . . .but the point is, Confirmation commissions you to be a witness by everything you do. Some of the new closing blessings at Mass are, in my opinion, kind of hokey, maybe a bit reductive, but it is worth pointing out somehow that the Mass ends with (and, in fact, in the West is named by) the word “sent”: ite, missa est can be translated simply, “go, you are sent” (or more literally: “this is the sending”). Most important, though, Confirmation is a sacrament. It is not a mission we take on ourselves, and not one we are sent out to do by our own power. As the oil seeps into our skin (see my post on this tomorrow), so confirmation strengthens us. We are meant to rely on his power, the power of Christ. We are marked with the sign of the Cross, both because we bear witness to Christ, and because it is Christ who gives us the strength to do it. The strength he gives is the strength of the Cross. The principal witnesses are the martyrs, who did not impose the faith, but suffered for it – and who were willing to face the end of their strength in the knowledge that Jesus is stronger even than death. Confirmation is, in one sense, a filling out of our Baptism. We can practice devotion to Confirmation by literally wearing a Baptismal garment: a cross, a metal, a scapular. But perhaps we would express the true meaning of Confirmation better by wearing our garment hidden under our clothes: a reminder that our witness is to be far more profound than a bumper sticker. In another sense, since Confirmation strengthens us when we are tempted to hide the light of Christ, it is like Confession. And so, like Confession, we can practice devotion to Confirmation through little acts of penance: in this case, little reminders to ourselves that we need to be tough, willing to suffer for the truth of the Gospel. Always we can make the sign of the Cross, and pray “come, Holy Spirit,” to enlighten and strengthen us for witness. “Gird thy sword upon thy thigh, O most mighty, with thy glory and thy majesty. And in thy majesty ride prosperously because of truth and meekness and righteousness” (Ps. 45:3-4). How do you keep alive your call to be an apostolic witness? “The anointing which you have received from him abides in you, and you have no need that any man teach you: but as the same anointing teaches you of all things, and is truth, and is no lie, and even as it has taught you, you shall abide in him. And now, little children, abide in him; that, when he shall appear, we may have confidence, and not be ashamed before him at his coming” (1 John 2:27-28). 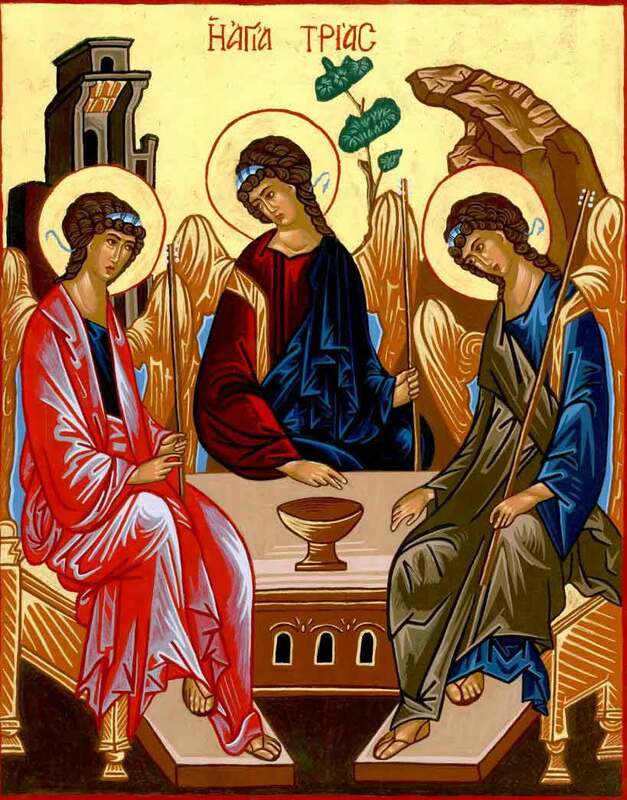 This is the same Apostle John, of course, who gives us this exchange between Jesus and Nicodemus: “Amen, amen, I say to you, Except a man be born again, he cannot see the kingdom of God . . . . Amen, amen, I say to you, Except a man be born of water and of the Spirit, he cannot enter into the kingdom of God” (John 3:3, 5). But how do we “abide in this anointing”? How do we actually live according to this most bizarre claim that we are “born again” by Baptism ? 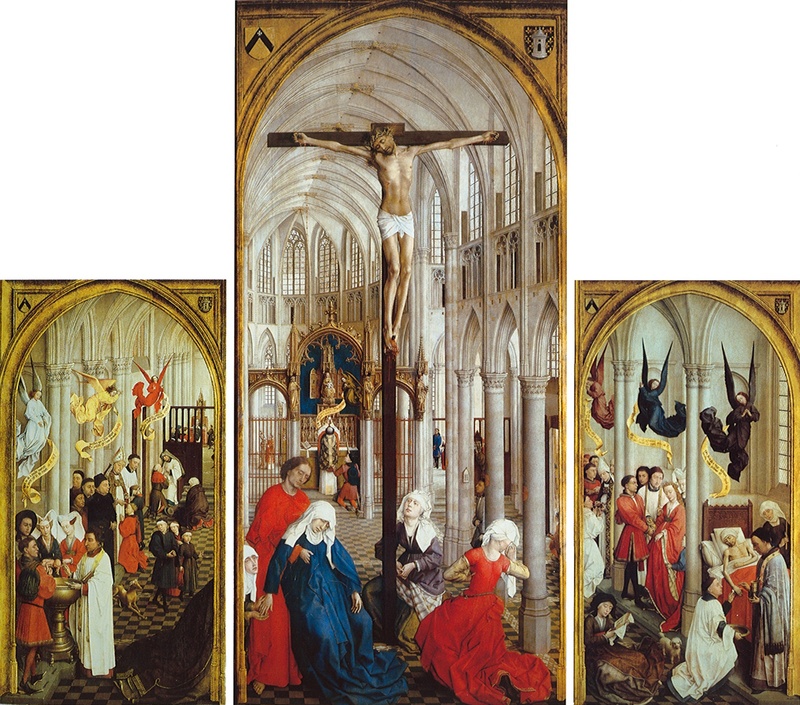 In fact, the Church gives us a wonderful frequent devotion to Baptism so common that we almost overlook it: the sign of the Cross. A whole spirituality is carried in this simple little devotion. The main place of the sign of the Cross is at the holy water stoup, as we enter the Church. Notice, in fact, that the little prayer we say as we make the sign of the Cross is simply the Baptismal formula: “Go you therefore, and teach all nations, baptizing them in the name of the Father, and of the Son, and of the Holy Spirit” (Matt. 28:19). “I baptize you in the name of the Father, and of the Son, and of the Holy Spirit.” These words are meant to call to mind our baptism, which is why they are attached to the holy water: nothing more nor less than a sacramental reminder of the waters of Baptism. Baptism is our entrance into the Church. Yes, it “washes away sin” – though the point of the John the Baptist stories is to remind us that first, Baptism was a sign of repentance, of beginning anew. The difference between John’s Baptism and the Baptism of Jesus is that Christian Baptism gives us the spiritual power to truly begin anew. That means leaving behind our former ways – and thus “washing away sin” – but more powerfully, it means entering into Christ: the anointing, and plunging into Christ. Baptism only “washes away” by “pouring in” divine life. It means, above all, entering into the sacramental life of Christ’s Church. Baptism gives us access to the sacraments. It is the beginning of the sacramental life. That’s why we remind ourselves of our Baptism when we enter the Church: it’s a delightfully literal symbol that Baptism is the way we “enter” the Church of Jesus. The physical sign we use, along with water, is a cross, drawn on our own body. (We can remind ourselves of this by making this cross actually look like a cross, not a sloppy hand wave.) The sign of the Cross reminds us that we are united to Christ. In Baptism we have died and risen with him. Our sufferings are united to his sufferings – and we are reminded that the divine love will include real suffering. But union with his suffering also means resurrection, the power of God that draws us through and beyond suffering. To mark Christ’s cross on our own body is no small thing! But the prayer we say, along with recalling our Baptism, recalls the spiritual heights to which we are called, the reason the Cross is worth it. We are called through the Cross into the very life and love of Father, Son, and Holy Spirit. Abide in that anointing. Live your Baptism. What does the sign of the Cross mean to you? In recent weeks we considered several names for the spiritual life as it relates to various persons of the Trinity, and then we considered St. Louis de Montfort’s four different names for the spiritual life as it relates to Mary. Today we begin a series that will consider how the sacraments can serve as names for the spiritual life. All of these things name the same basic reality: our incorporation in Christ, our sharing in the life of God. But they highlight it in different ways. This is important because in fact it is easy for us to lose track of what the spiritual life is really about. The two basic poles of the spiritual life are God as our destination and God as our means of reaching that destination. “Charity,” or divine love, is the theological name for loving God as the ultimate good toward which everything is aimed. Grace is the theological word for the transformation of the person by contact with God: the work God does in us. Our constant temptation is to sink into ourselves. We replace charity with love of self when we focus on experience, as if the real point of the spiritual life was to have visions, or warm fuzzy feelings – or no feelings: spiritual dryness can be idolized too. In fact, I fear that there’s a certain kind of pseudo-mysticism about where people feel like if they space out, especially in the presence of the Blessed Sacrament, that emptying of the mind is the presence of God. Liberal Catholics call this “centering prayer,” and conservative Catholics know it must be bad. But I think a lot of conservative, or quasi-orthodox Catholics, also think silence itself is prayer: a dangerous incursion of Buddhism, a loss of the fire of charity. But so too can be the fad of journaling. Now, Mother Teresa herself, a real model of divine charity, seems to have liked both silence and journaling. But what are we journaling about? Are we gazing at ourselves in the mirror? Or are we creating a God in our own image, describing the God we love in our own terms, rather than his? To love truly, we have to keep our eyes on God. Scripture can be a helpful way to do that, which is why the tradition is so in love with the Psalms and various kinds of lectio divina. But in any case, the point is, Catholicism urges us to look beyond ourselves. The true Christian spiritual life maintains charity by thinking about the various names for the spiritual life we have been considering. The same is true of grace. The constant temptation is to think either that we do it all by our own power (or by the human power of our community) or that we cannot do it – despair is just another angle on trusting in our own powers. When we lose a clear sense that the spiritual life is the work of the divine Trinity, or of the Lord, incarnate in Mary’s womb, true spirituality is replaced. On the one hand, we focus on our own strength, and begin to exalt in what we do for ourselves instead of what God does for us. But on the other hand, since our own strength can’t get us very far, we begin to set our sights too low, as if the things we can do on our own are the only possibilities of the spiritual life. The spiritual life without an intense emphasis on divine grace becomes hardly any spiritual life at all. In the next several weeks we will go through the seven sacraments, considering the richness of naming the spiritual life by reference to Baptism, or Confirmation, or the Eucharist (either sacrifice or communion), or Penance, or the Anointing of the Sick, or the Priesthood, or Marriage. 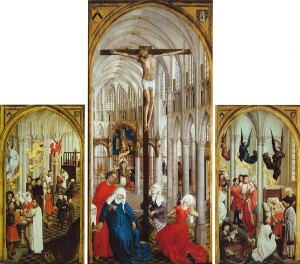 In fact, each of these sacraments provides an excellent description of the spiritual life as a whole. But first, briefly, what is a sacrament? Sacraments are signs that give what they signify. Baptism is a symbol of spiritual washing – and it does in fact spiritually wash us. Sacraments provides an intense focus on grace. Just as touching the hem of Jesus’s robe made clear that grace came from him, not from our own power, so too with the sacraments. The sacramental life means trusting in his power. And the sacraments make vivid that the spiritual life means coming out of ourselves in pursuit of the Good God. They are profound signs of the spiritual reality of Christianity. How do you find nourishment through the sacraments?